Two blondes, both beautiful. They make up a country music duo called Bomshel, but don’t chalk the name up as a glitzy showbiz come-on. According to co-founder Kristy Osmunson, Bomshel has a serious message to deliver. More than anything, she said, the group’s intent is to fly in the face of the traditional image that saddles female performers of the country persuasion. Daughter of former Sandpoint dentist Willard Osmunson and Sandpoint High nursing teacher Kathy Holm, Osmunson, 29, grew up playing fiddle with Sandpoint’s Fiddler’s Hatchery and went on to study voice and sing in school choirs. The 1999 SHS graduate attended the University of Idaho, where an instructor encouraged her to pursue a nascent interest in country music. Next stop, Nashville. 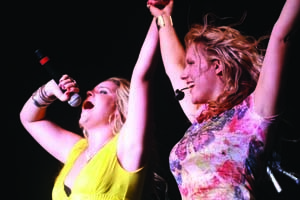 After more than five years of honing songwriting skills and trying new material out, she and duo partner Kelley Shepard snagged two Top 30 chart rankings in 2009. The first of them was “Fight Like a Girl” – the chronicle of Sandpoint resident Jenny Meyer who was diagnosed with breast cancer while pregnant with her daughter, Grace. Jenny went on to battle cancer for the next eight years and inspired a song that Osmunson said has touched the lives of women and girls ever since. Although Nashville is where she lives and works, Sandpoint will always be home, the musician pointed out. When reached in the spring for this interview, Osmunson had just completed a day of rigorous physical training as part of a weeklong exercise “boot camp.” Given the active nature of Bomshel’s stage show, in which Osmunson often climbs up to play from scaffolding and lighting rigs, staying in shape is part of the act. Has Bomshel always been known for a physical performance? Yeah, it’s fun. I can’t really halfway do anything. It’s got to be 100 percent. I’ll never forget when I decided to be a country singer. I went to a show of one of my favorite singers when I was at University of Idaho and I paid, like, $45 to go to this show. And I was so disappointed, because she stood there with this guitar and played the whole time. That concert made me think, “I can do better than that.” If she’s out there making a living just standing there – and I paid $45 to watch her – then there needs to be a girl who goes out and kicks the door down in country music, because that was boring. Ironically, she and I are good friends now, but I’ve never told her that story! Have you always been comfortable on stage? No, I had horrible stage fright. 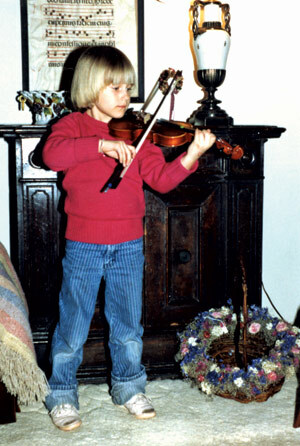 But I grew up playing the fiddle and as soon as I picked it up, it was the weirdest thing. Having an instrument in my hands is the key; it somehow just takes all my nerves away. I would be so paranoid to have to stand there with just a microphone and sing a song. But if I’m playing guitar or fiddle, I can entertain and do all these different things. I don’t know why, but my comfort level is just so much better. What drew you to Nashville? It was really bizarre, actually. At U of I, I was playing some of my original songs for my vocal coach as I was getting ready for my junior recital and he sat me down and said, “Kristy, I hate to tell you this, but these are country songs.” I was like, “No, no, no – I don’t write country songs. That’s embarrassing. That’s cheesy and goofy. I would never write country songs.” He told me, “These are definitely country songs and it’s kind of who you are. You may try to deny it, but the stories that you tell are country.” It was funny, because coming down to Nashville, I realized that he was right. I was supposed to be here. I knew it the minute I stepped off the plane. Is it fair to say that you moved into country music at a time when the rules had changed? I think that’s a very fair statement. It’s one of the things that makes me so excited about being in this industry right now. I feel like, artistically, I get to really stretch myself in ways that, even when I showed up here six or seven years ago, weren’t possible. I just got out of the studio where we were working on a new single, and we were recording this straight-up rock song, and I had no idea where to put a fiddle on it. I took my violin, restrung it, started playing around with the tuning … and so I just kind of wail on it and play all these different sounds. The engineer said, “Man, Kristy – I’ve been in this town for 40 years and this would only work right now. A year ago, I would’ve shaken my head and laughed, but there’s nothing that can’t be done right now.” It was so exciting for me to hear that, because there really aren’t a lot of rules any more. Besides musically, it seems like Bomshel is pushing the limits of songwriting attitudinally as well. Is that a conscious decision on your part? Well, we try to. I think country radio is slow on the upswing as far as embracing that. The audience we speak to is really girls – most of the time, younger girls. And it’s almost like we have these gatekeepers of middle-aged men who want to hate everything. … We like to say things in our songwriting. Life is short and, if you’re going to say something, I feel like it should have a message behind it. You don’t have to look a certain way or act a certain way. Just embrace all the flaws that make you different and embellish on that. That’s something that’s so terrifying for women, I think, because we all kind of want to look like each other. That’s disgusting to me. It’s ludicrous. But you’ve just described a big part of country music, haven’t you, where all the female artists seem to be blonde and almost look like they could be related to one another? Is it a constant challenge to be recognized more for your talent than for the “Hey, here’s a couple of good-looking chicks – we can market the hell out of that” aspect? It’s a double-edged thing. Last week, we were told that both of us need to drop 20 pounds, and I just started laughing. Whether we’re a size 6 or a size 8, whatever it is that we are, if that’s not right, then we need to change our name, because it’s about embracing who you are. I will say, though, that because of the color of our hair and the fact that we’re two girls, it is difficult. First of all, people don’t believe that we’ve written our own songs or produced our own record and helped play almost every instrument. That’s why we’ve always been a touring act, because once people see us live, they understand. How has life changed for the group since “Fight Like a Girl” hit the charts last year? Did you know Jenny, the woman who inspired that song? No, I didn’t. But I watched how she had touched and affected so many people through her story and her willingness to share her experience. When my mom told me that she had passed, it just hit me. I just started balling my eyes out. I wanted Bomshel to embody something that Gracie’s mom would’ve wanted her to have. I feel like that song was Jenny’s last gift. I don’t think I had a lot to do with writing that song, I really don’t. I just held the pen – it was her story. All of the royalties, everything from that song, has gone back to Komen breast cancer research. I feel very blessed to have been able to be a part of that. What’s the best gig Bomshel has ever had? Oh, man. The one in Sandpoint – The Festival at Sandpoint – was pretty special. … There have been a lot of incredible shows. But there has been nothing like being able to come back to Sandpoint and just be around my family, my friends and my community. Were you aware that, after that show, there was a ton of little girls who wanted to be you when they grew up? That’s so cute. That’s really, really sweet. I’ll never forget when I was in an ice cream place down here and standing there was Faith Hill. My little 5-year-old inside of me just freaked out. I was so excited. And just as I’m standing there thinking, “This is why I love living in Nashville,” in walks Alison Krauss. I just about came out of it. … To have little girls think that about me is so flattering, I can’t even tell you. If there’s any little girl who wants to do music, I think that’s what they should do. Follow your dreams. The Bomshel music videos are strong. What was it like to produce those? It’s a lot more work than I knew it was. I didn’t understand the whole concept of doing 45 takes of something. And with music videos, you’re playing along to your own music and it’s the most embarrassing thing I’ve ever done. With the “Fight Like a Girl” video, we started filming and I got so paranoid about how silly I looked singing along to my own music that I literally had to stop and get a glass of wine to calm myself down. I finally figured out that I was taking it entirely too seriously. If you can tap into that person you were when you were 13 and you’re singing into the mirror with a hairbrush – that person who just doesn’t care – if you can bring her into the picture, then it’s absolutely a blast. There’s an image of Nashville where songwriters step off the bus with stars in their eyes and hit the streets in search of fame. Does that really happen there? Every day. Every day. I was downtown at Tootsies (an iconic Nashville nightspot where several early country music stars got their start) Sunday night and I walked out of the bar and here was this kid standing on the street corner … with his guitar case and I walked up to him and said, “You just got here today, right?” He goes, “Yeah, how did you know?” I told him, “It’s all over your face.” He wanted to be a singer and I told him to play me a song. He said, “Right now? We’re out here on the street!” I told him that’s the way we do it in Nashville. He pulled out his guitar and a little audience gathered around and he played me a song. I said, “Well, you’ve got the first part of what it takes, which is a lot of guts.” … Being in Nashville is not magic. It’s not like someone just discovers you when you get here. It’s a job, like everything else. You have to want it in a way that only a few people can understand.